Determining theme and central message in literature is one of the most difficult standards to teach and master. Provide your students with the proper tools and resources that will ensure students' success. 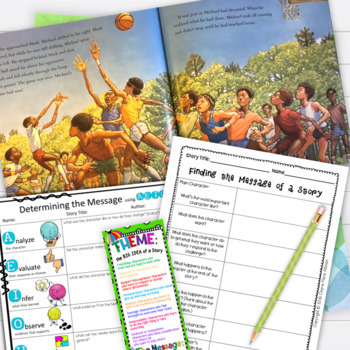 This standards-based resource is LOADED with all the essentials necessary for teaching your students how to find the theme and central message in any story, including folktales, fables, or fairy tales, as well as successfully summarizing the stories during the process. With so many resources in this toolkit, you can scaffold or differentiate your instruction the way you see fit to best meet your students' needs. If you don't teach Common Core, you will still find this toolkit relevant and valuable to your instruction when teaching theme and central message. The resources in this toolkit were created out of a great need to break this standard down to make it more tangible for students. These tried and true components have helped my students be successful as well as many students of other teachers who have purchased and used these tools in their own classrooms. Take a look below at what other teachers have to say about this essential theme and message resource! ✨Visit my blog post for tips on teaching theme and central message. PLEASE see preview to view ALL the resources available in this toolkit. Note: This toolkit provides multiple approaches to finding the theme & central message using questioning strategies that guide students' thinking. ✔ An introduction to teaching theme and message. This understanding is key to effective instruction that guides students in the right direction with this common core expectation. ✔ A colorful anchor chart that can be displayed all year and will become students’ go-to reference for helping them think about the big ideas and central messages found in the many stories they read. ✔ Colored graphic organizers (for retelling and determining theme and message) that can be used as a tool for modeled lessons throughout the year. You can either display on your SmartBoard as you model the process during whole group think aloud or display in the classroom (as a laminated poster) to be reused with each read aloud lesson. ✔ Readers’ Notebook Vocabulary templates for learning theme vocabulary such as compassion, perseverance, etc. Note: The task cards are already mismatched on each page for your convenience. Copies can be given to students as is, and they can cut and match accordingly. Carissa J. wrote- "This is an INCREDIBLE source for theme and message! It is the best one I have seen and I have researched a lot on what the most successful way to teach theme and the author’s message. My kids were so engaged during our week long focus on theme and message. 100% of my students were able to identify the theme and message of two stories on their Friday assessment. Thank you!!" 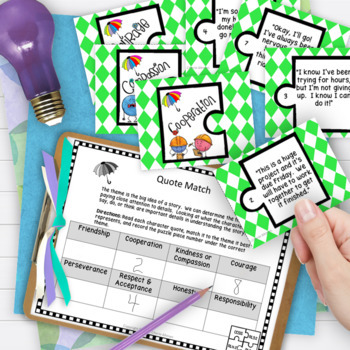 Danielle B. wrote- "Just like with your character trait resource, I LOVE your task cards. I use them whole group to introduce and practice the skill and then I keep them in our literacy center area, so the kids can revisit them more independently. I keep the posters hung while we are working on the concept and they are simple enough for the kids to really refer back to. This is a wonderful purchase!" 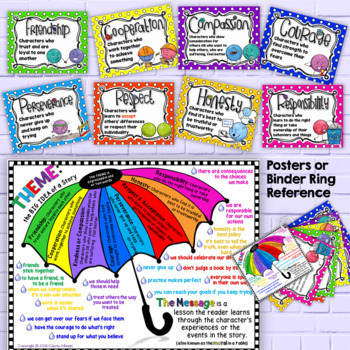 Virginia T. wrote- "I used this resource to help my students understand theme. The graphic organizers are wonderful! My students were able to track their thinking effectively and develop good theme statements. Great resource!" 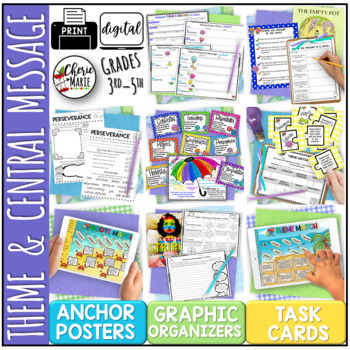 ❗ I highly suggest you preview these character toolkits, as these resources go hand-in-hand with determining theme and central message.